When you’ve been through the mill, especially if you haven’t and may never actually wholly extricate yourself from the grinding cogs of the mill, happiness almost seems a frivolity. Just surviving one minute to the next is achievement enough. ‘Cheer up – it may never happen’ is likely to earn someone a thump more than a smile. It did happen, it’s still happening on some level. Even as a dedicated gardener, when offered the reassurance ‘You’ve still got your garden’, the incredulity that anyone could think my garden was an adequate substitute for my baby at least filled me with enough anger to get me through another day. 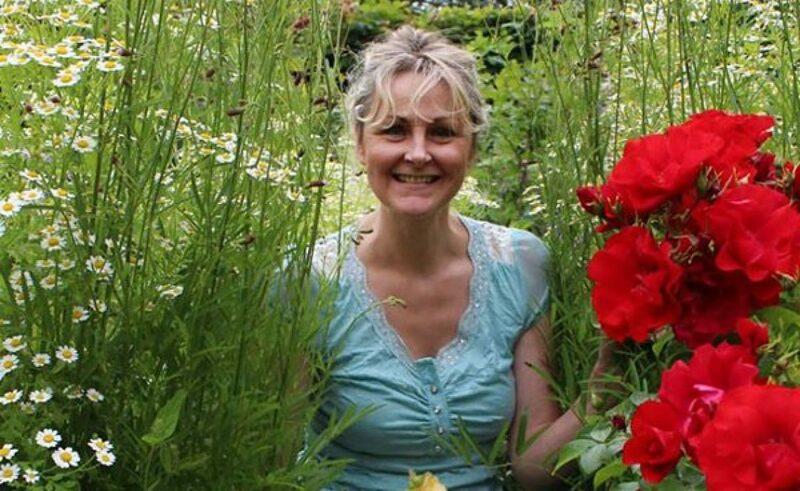 Yet here I am, smiling, and proudly publishing a book full of stories of how gardens, gardening and our innate connection with nature have affected people’s lives – in the most positive ways. A year touring the country in my old VW Daisybus brought me into contact with brave, funny, inspirational people. Laughter, even in the middle of interviews about the saddest of subjects was a defining element of my year. But not all the stories are heart-rending. Artists, composers, eco warriors, proud owners of spectacular herbaceous borders, apologetic enthusiasts of less spectacular but equally loved flower beds, folk carrying on a family tradition and folk new to the whole ‘grown-ups playing outside’ thing. Happiness for them is outside their back door – and front door and side alleys and anywhere else they can squeeze another idea, another plant. Happiness comes in different sizes. Different tones . Sometimes it feels more like contentment, a meditation, a release, than a zinging joy, but it’s happiness by any other name. And sometimes, when the sunshine is on your face, when your nose is buried in a rose or your whole body is caught in a scented drift of philadelphus blossom, the sensation is so exquisite that you almost feel that the meaning of life is right there floating around you. A sunny day in the garden is touching on enlightenment. To me that is happiness. The Daisybus Gardens of Wellbeing near Solva will be opening Summer 2017. Sarah’s book Sunshine Over Clover – Gardens of Wellbeing is available from Amazon. This post ‘Happiness is Sunshine’ first appeared on Life Seeker.